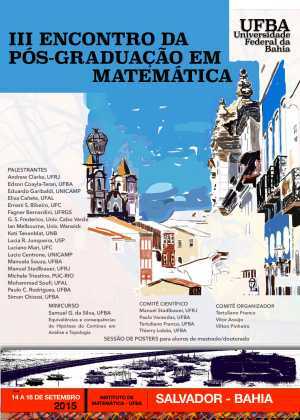 About me: I finished my PhD in Mathematics at IMPA, Rio de Janeiro, Brazil, in 2011. My thesis subject was about Probability, concerned with Interacting Particle Systems. 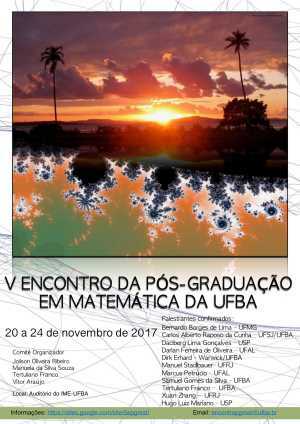 Currently, I am professor at the Departament of Mathematics of UFBA - Universidade Federal da Bahia, and CNPq researcher (level 2). This is my personal page, here you will find informations about my research, publications, teaching, Math olympiads, and personal stuff. Sobre mim: terminei meu doutorado em Matemática no IMPA, localizado no Rio de Janeiro, Brasil. Minha tese de doutorado foi em Probabilidade, a respeito de Sistemas de Partículas Interagentes. 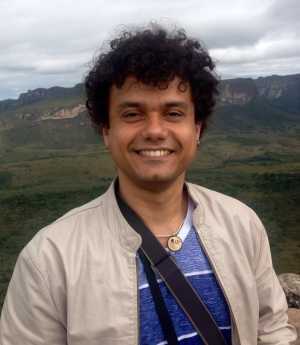 Atualmente, sou professor adjunto do Departamento de Matemática da UFBA - Universidade Federal da Bahia e Bolsista de Produtividade do CNPq (nível 2). Esta é minha página pessoal, onde estão disponíveis informações a respeito de minha pesquisa, publicações, ensino, olimpíadas de Matemática, e coisas pessoais. 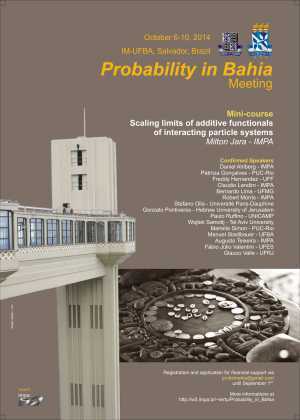 Research Interests Probability Theory, in special Interacting Particle Systems. My main subjects are Hydrodynamic Limit, Fluctuations, Large Deviations, and its connections with Statistical Mechanics and Partial Differential Equations. D. Erhard, T. Franco, P. Gonçalves, A. Neumann and M. Tavares. Non-equilibrium fluctuations for the SSEP with a slow bond. Preprint, 2019. T. Franco and M. Tavares. Hydrodynamic Limit for the SSEP with a Slow Membrane. Journal of Statistical Physics, Vol. 175, Issue 2, pages 233--268, 2019. T. Franco, P. Gonçalves, A. Neumann. Non-equilibrium and stationary fluctuations of a slowed boundary symmetric exclusion. Stochastic Processes and their Applications, Vol. 129, Issue 4, pages 1413--1442, 2019. T. Franco, A. Neumann. Large deviations for the exclusion process with a slow bond. Annals of Applied Probability Vol. 27, No. 6, 3547--3587, 2017. T. Franco. Phase transition in the KMP model with slow/fast boundaries. Markov Processes and Related Fields, Volume 23, Issue 1, 171--186, 2017. T. Franco, P. Gonçalves, M. Simon. Crossover to the stochastic Burgers equation for the WASEP with a slow bond. Communications in Mathematical Physics, Volume 346, n.3, 801--838, 2016. T. Franco, P. Gonçalves, G. M. Schütz. Scaling limits for the exclusion process with a slow site. Stochastic Processes and their Applications, Volume 126, Issue 3, Pages 800–831, 2016. L. Avena, T. Franco, M. Jara, F. Völlering. Symmetric exclusion as a random environment: hydrodynamic limits. Ann. Inst. H. Poincaré Probab. Statist. Volume 51, Number 3 (2015), 901-916. T. Franco, J. Haddad. Continuous dependence on the derivative of generalized heat equations. Differential and Integral Equations, Volume 28, Numbers 1-2 (2015), 59–78. T. Franco, P. Gonçalves, A. Neumann. Phase Transition of a Heat Equation with Robin's Boundary Conditions and Exclusion Process. Trans. Amer. Math. Soc. 367 (2015), 6131-6158. T. Franco, P. Gonçalves, A. Neumann. Occupation time of exclusion processes with conductances. Journal of Statistical Physics, Volume 156, Issue 5 (2014), Page 975-997. T. Franco, P. Gonçalves, A. Neumann. Phase transition in equilibrium fluctuations of symmetric slowed exclusion. Stochastic Processes and their Applications, Volume 123, Issue 12, December 2013, Pages 4156-4185.
together with: T. Franco, P. Gonçalves, A. Neumann. Corrigendum to: Phase transition in equilibrium fluctuations of symmetric slowed exclusion. Stochastic Process and their Applications, Volume 126, Issue 10, October 2016, Pages 3235-3242. T. Franco, P. Gonçalves, A. Neumann. Hydrodynamical Behavior of Symmetric Exclusion with Slow Bonds. Ann. Inst. H. Poincaré Probab. Statist. Volume 49, Number 2 (2013), 402-427. T. Franco, P. Groisman. A Particle System with Explosions: Law of Large Numbers for the Density of Particles and the Blow-up Time. Journal of Statistical Physics, Volume 149, Issue 4, pp 629-642, November (2012). T. Franco, A. Neumann, G. Valle. Hydrodynamic Limit for a Class of Exclusion Type Process in Dimension d ≥ 2. Journal of Applied Probability, 49.2, p.333-351, 2011. T. Franco, C. Landim, Hydrodynamic Limit of Gradient Exclusion Processes with Conductances. Archive for Rational Mechanics and Analysis, v.195, p.409 - 439, 2010. T. Franco, P. Gonçalves, A. Neumann. Equilibrium fluctuations for the slow boundary exclusion process. From Particle Systems to Partial Differential Equations IV. Springer Proceedings in Mathematics & Statistics, 2017. A. Baraviera, T. Franco, A. Neumann. Hydrodynamic limit of quantum random walks. From Particle Systems to Partial Differential Equations III. Springer Proceedings in Mathematics & Statistics Volume 162, 2016, pp 39-50. T. Franco. Interacting particle systems: hydrodynamic limit versus high density limit. From Particle Systems to Partial Differential Equations. Springer Proceedings in Mathematics & Statistics Volume 75, 2014, pp 179-189. T. Franco, P. Gonçalves, A. Neumann. Slowed exclusion process: hydrodynamics, fluctuations and phase transitions. From Particle Systems to Partial Differential Equations. Springer Proceedings in Mathematics & Statistics Volume 75, 2014, pp 191-205. Franco, T., Gonçalves, P. and Neumann, A.: Dynamical phase transition in slowed exclusion processes. Modeling, Dynamics, Optimization and Bioeconomics I. Springer Proceedings in Mathematics & Statistics Volume 73, 2014, pp 269-278. M. Cicconet, T. Franco and P. Carvalho. Plane Tessellation with Musical Scale Tiles and Bidimensional Automatic Composition. Proceedings of the International Computer Music Conference. New York, 2010. Banco de Questões OBMEP 2014. Banco de Questões OBMEP 2013. Introdução à Probabilidade só com Moedinhas. Tertuliano Franco, Marcelo Hilário, Pietro Silva. 1ª ed. Teresina: Universidade Federal do Piauí, 2012. Banco de Questões OBMEP 2012.